Dublin 0-8 Mayo 0-6 (Croke Park, 8/2/1987). MAYO: G Irwin; M Carney, S Durcan, K Beirne; J Browne, J Maughan, J Finn; TJ Kilgallon (0-1), WJ Padden; T Reilly, D Flanagan (0-2, frees), N Durcan; S Clarke (0-1), P Forde, T Grogan. Subs: D Carney for Kilgallon, B Kilkelly (0-1) for Reilly, L Niland (0-1) for Grogan. Mayo 1-6 Kerry 4-6 (James Stephens Park, Ballina, 22/2/1987). MAYO: J Cuddy; M Carney, S Durcan, K Beirne; J Browne, J Maughan, J Finn; TJ Kilgallon (0-2), D Kearney; S Clarke (1-0), D Flanagan (0-2, frees), N Durcan; L Niland (0-1), P Forde, K McStay. Subs: T Grogan for Forde, P Higgins (0-1) for Durcan, F Noone for Finn. Mayo 0-6 Meath 0-3 (Fr O’Hara Park, Charlestown, 8/3/1987). MAYO: J Cuddy; M Carney, S Durcan, D Flanagan; F Noone, J Maughan, J Finn; D Kearney (0-2), TJ Kilgallon; S Clarke, N Durcan (0-1), P Brogan (0-3); K McStay, J O’Grady, P Higgins. Subs: J Lindsay for Clarke, WJ Padden for McStay, J Browne for McStay. SEMI-FINAL: Mayo 3-17 Sligo 0-6 (MacHale Park, 21/6/1987). MAYO: E Lavin; M Carney, J Browne, D Flanagan; F Noone (0-1), J Maughan, J Finn; TJ Kilgallon, WJ Padden; L Niland (1-2), N Durcan (0-2), P Brogan (1-2, one point from a free); K McStay (0-4), L McHale (1-4), A Finnerty (0-2, one from a free). FINAL: Mayo 0-7 Galway 0-8 (MacHale Park, 12/7/1987). MAYO: E Lavin; M Carney (0-1), J Browne, D Flanagan; F Noone, J Maughan, J Finn; TJ Kilgallon, WJ Padden; N Durcan, D Kearney (0-1), P Brogan (0-4, all frees), K McStay, L McHale, L Niland (0-1, free). Subs: M Collins for Noone, M Butler for Kilgallon, T Byrne for Butler. Mayo 2-8 Cork 0-7 (Fr O’Hara Park, Charlestown, 8/11/1987). MAYO: E Lavin; J Browne, J Maughan, D Flanagan; F Noone (0-1), WJ Padden, J Finn; P Brogan (0-1), L McHale; D Kearney (0-1), TJ Kilgallon, L Niland; A Finnerty, M Carney (0-5), J Lindsay (2-0). Subs: M Fitzmaurice for Kearney. Armagh 4-5 Mayo 1-6 (Athletic Grounds, Armagh, 22/11/1987). MAYO: E Lavin; J Browne, J Maughan, D Flanagan; M Collins, WJ Padden, J Finn; P Brogan (0-3), L McHale; D Kearney (1-0), TJ Kilgallon, L Niland; A Finnerty (0-1), M Carney (0-1), J Lindsay (0-1). Sub: M Fitzmaurice for Niland. Derry 1-9 Mayo 1-9 (Ballinascreen, 6/12/1987). MAYO: E Lavin; M Collins, J Maughan, D Flanagan; J Browne, WJ Padden, J Finn; P Brogan (0-2), TJ Kilgallon; M McGrath, D Kearney, L Niland (0-1); A Finnerty, M Carney (0-5), J Lindsay (1-1). Sub: L McHale for Kilgallon. Mayo 2-10 Monaghan 1-4 (James Stephens Park, Ballina, 13/12/1987). MAYO: E Lavin; M Collins, J Maughan, D Flanagan; J Browne, WJ Padden, J Finn; P Brogan (0-2), P McStay; TJ Kilgallon, D Kearney, L Niland (0-1); A Finnerty (0-1), M Carney (1-5), J Lindsay. Subs: M McGrath (1-0) for McStay, L McHale (0-1) for Kearney, M Butler for Niland. SEMI-FINAL: Roscommon 0-10 Mayo 0-7 (Na Piarsaigh GAA club, Ballinasloe, 11/4/1997). MAYO: J Commins; L Monaghan, TJ Coleman, K Beirne; P Holmes, D Fitzgerald, E Gilvarry; G Maher, L Niland (0-2); P Jordan, M Butler (0-2), J French; M Fitzmaurice (0-3), L McLoughlin, MJ Mullen. Subs: P Fallon for French, T O’Grady for Jordan. This match was originally fixed for Dr Hyde Park but the venue was deemed unplayable so the tie was switched to Ballinasloe. PRELIMINARY ROUND: Leitrim 3-5 Mayo 3-11 (Pairc Sean MacDiarmada, Carrick-on-Shannon, 9/5/1987). 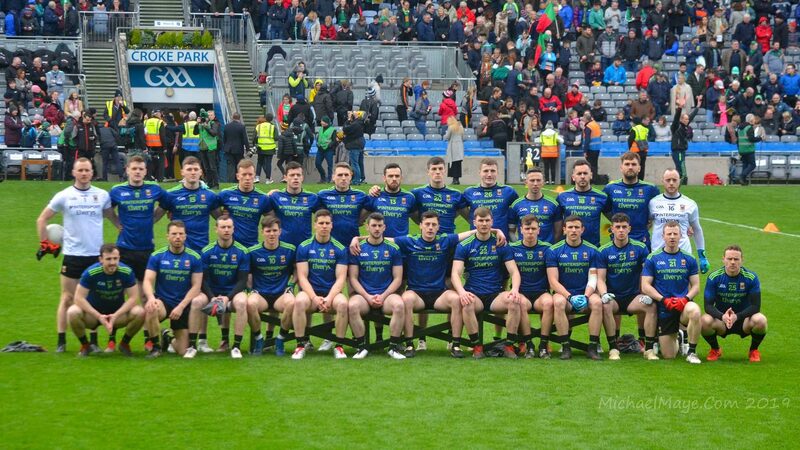 MAYO: J O’Grady; M Carroll, G McNicholas, D Delaney; S Cosgrove, J Jennings, E Callaghan; R Dempsey (0-2), S Forde (0-1); M Coleman (1-1), T Morley (1-1), C Goulding (0-1); T Gibbons (1-1), D Reilly (0-3), A Joyce (0-1). Subs: T Maloney for Gibbons, P Healy for Golding. SEMI-FINAL: Sligo 0-6 Mayo 2-11 (Markievicz Park, 27/6/1987). MAYO: J O’Grady; M Carroll, P Waldron, A Waldron; M Coleman (1-0), J Jennings (0-1), G McNicholas; R Dempsey, S Forde (0-1); C Goulding (0-1), T Morley, S Cosgrove (0-1); T Gibbons (1-2), D Reilly (0-1), A Joyce (0-1). Subs: T Kelly (0-3) for Goulding, A McDonagh for Gibbons. FINAL: Mayo 2-4 Galway 2-8 (MacHale Park, 12/7/1987). MAYO: J O’Grady; G McNicholas, P Waldron, A Waldron; N Jennings, J Jennings, G Mulhern; M Coleman, S Forde; T Joyce, D Reilly (0-3), L Barrett; T Gibbons (1-0), T Morley, T Kelly (0-1). Subs: R Dempsey (1-0) for Morley, S Cosgrove for Joyce, T Morley for Gibbons.